Arjen Robben says Bundesliga leaders Borussia Dortmund pose the biggest threat to Bayern Munich's chances of landing a seventh successive title. 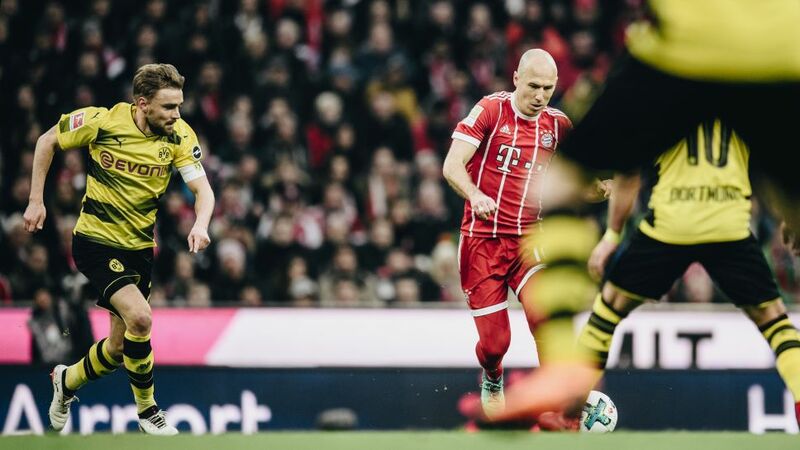 Four points and four teams - RB Leipzig, Borussia Mönchengladbach, Werder Bremen and Hertha Berlin - stand between pacesetters Dortmund and sixth-placed Bayern after seven matches, but Robben isn't overly concerned by the current status quo. "Dortmund mean business, they're a real force," Bayern's veteran winger told Germany's leading sports specialist magazine kicker. "As far as the others go, we'll have to see how long they're able to keep up with the pace." Bayern made an ominous start to their title defence under new coach Niko Kovac, posting comfortable wins over Hoffenheim, VfB Stuttgart, Bayer Leverkusen and Schalke. A three-game winless run, comprising a 1-1 home draw with Augsburg and back-to-back defeats against Hertha Berlin and Gladbach, however, has led many to question whether the Munich giants' reign could be coming to an end. "I think it's a good thing the way the table is looking right now," Robben countered. "It's what everyone wanted, but I'm not worried. Just because you're winning doesn't mean everything is going well. By the same token, it doesn't mean some things aren't going to plan when you're not. I'm sure it's all in the small details. We need to play with passion, move the ball better, bring back the surprise element and start dominating the opposition again." Robben, who is enjoying his 10th season as a Bayern player, has the opportunity to set the record straight when Bayern travel to mid-table Wolfsburg on Saturday. The 34-year-old is the club's joint-top Bundesliga scorer in 2018/19, alongside Robert Lewandowski, with three goals in six matches.